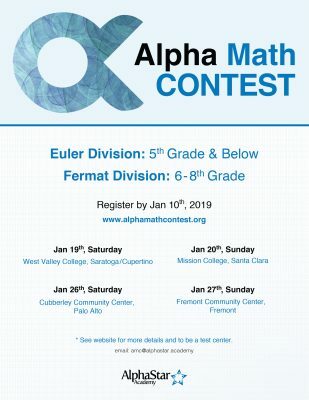 Alpha Math Contest is a math competition for elementary and middle school students. The first round will be in January. 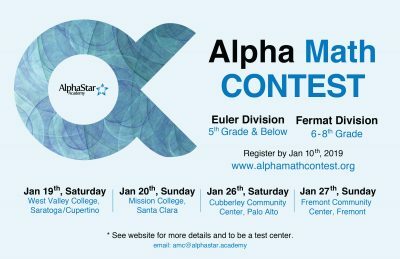 It will be offered at AlphaStar Test Centers in Bay Area and registered organizations nationwide. Top scoring students will be invited to the the final round in Bay Area. I like this course because the teachers explain the content very well and I am able to catch on very easily. I feel like the classes have been very easy, since whenever I had doubts, the instructors would clear them. Very funny. He gives out candies for points you receive called 'good goods'. I really liked the way the teacher explained things out- it was very easy to understand. Also, they made it very clear on how to spot errors and they got me in the habit of having good syntax. Learned very well in this course. Another thing is that I liked the practice problems on the website. They made practicing easy and fun, as well as teaching us how to do things. I really liked this course because unlike many other programming classes, this provided a perfect balance of practice, fun, and learning.